If you’re a bride-to-be who’s a lover of all things soft, feminine and glamorous, then prepare to be dazzled (quite literally!) by this wedding dress collection. Here at BTM, we get giddy whenever we see anything from Mon Cheri in our inboxes, especially if they are gowns by their stellar designer, Martin Thornburg! Featuring an assortment of gorgeous styles ranging from traditional ball gowns to modern wedding dresses, Martin Thornburg – a Mon Cheri Collection offers today’s stylish brides dresses with high-quality fabrics, hand-beaded Swarovski crystals, and impeccable fit at an affordable price. Martin Thornburg designs each gown as a work of art with subtle, intricate touches that are as special as each bride. Take, for instance, Style 118281 Coda, an amazing strapless sweetheart lace over tulle, sequined tulle and organza A-line gown that presents a unique allover beaded and embroidered pattern mimicking floral vines. Can you even try to peel your eyes away from this lovely number? As you browse through the collection you’ll find the latest in bridal trends including elegant hues of champagne and gold, plunging necklines, open backs and illusion details, like 118260 Minuet. For the bride who dreams of an outdoor wedding, the perfect choice will be Style 118252 Pavane. 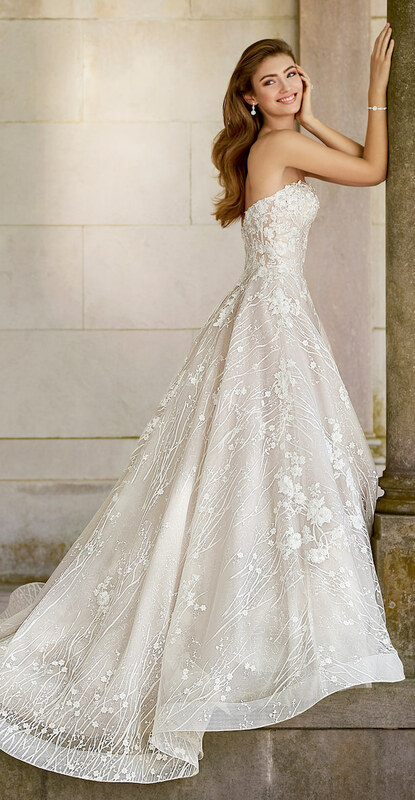 Taking “garden romance” to a whole new level, it features beading and lace appliqués with a unique allover pattern mimicking floral vines. The beaded spaghetti straps and the deep v-neckline bring up the sensuality factor, while a slimming beaded natural waist and the deep scooped back add a glamorous touch. Martin Thornburg – a Mon Cheri Collection presents gowns that are gorgeous at every angle and silhouettes that are simply swoon-worthy. You can see each and every one of these characteristics reflected in gowns like Stanza 118254 and Cabaletta 118270. Take Stanza, for instance, an awe-inspiring beading and embroidery a-line gown. This style displays a v-neckline over the sweetheart bodice and the illusion side panels that make it a total dream! Want to see more stunning gowns from Martin Thornburg? Check out all the collections in full at MonCheriBridals.com. For the latest updates and more inspiration, you can also follow Martin Thornburg on Instagram and Facebook. This post has been sponsored by Mon Cheri Bridals in partnership with BrideClick, but concerns our own opinion. Thank you for supporting our partners.